When my little girl was seven she thought she was a princess. Sometimes she thought she was a fairy, but mainly she thought she was a princess. In her world, princesses lived in castles and wore pretty dresses. We could manage the pretty dresses, but struggled with the 'living in a castle' part! "one purple wall, purple curtains, a white bed and a walk in wardrobe please"
Not wanting to go to the expense of building walls to accommodate this request and to be honest not really wanting to appear to bow to her commands, I set about thinking of a compromise. She had a double build in wardrobe in her room, so we removed the doors. 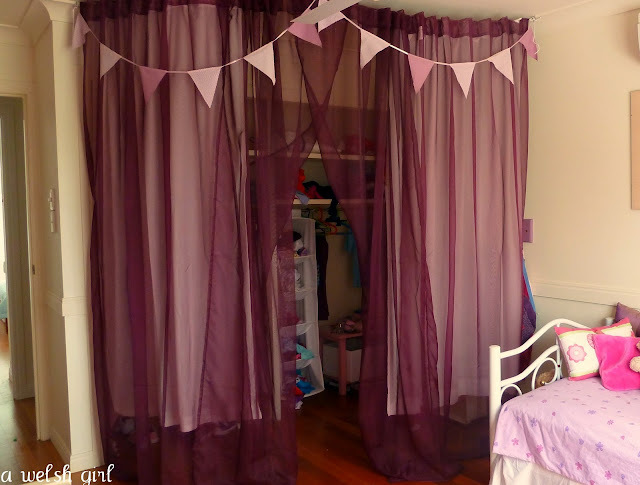 Next we hung some sheer curtains with some space to create a dressing area. Voila - a walk in princess wardrobe, or as Sibs now calls it her 'dressing area'. She keeps it relatively tidy, but she's only eight so some stuff finds its way off the hangers and on to the floor, and the double layer just keeps enough out of sight. Fortunately one of the ceiling down lights is located just inside the dressing area and this creates a perfect light. The original wardrobe doors have been kept so that bar a few holes in the ceiling it's a very simple job to convert back to a built in. 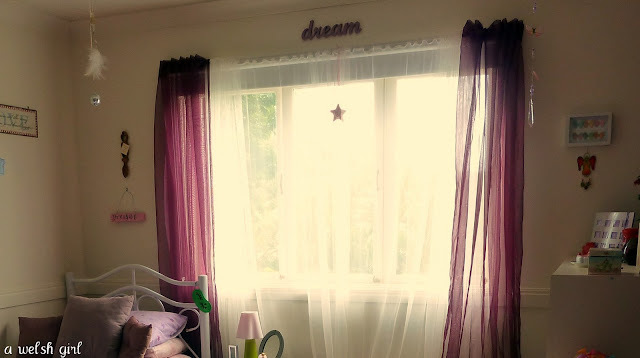 I bought the same curtains for the windows and the clever people at the paint shop mixed up some paint so that the purple wall that was requested could be matched. So there you go an easy dressing area/walk in wardrobe make over fit for a princess. Beth this idea is genius - and yes you simply have to love IKEA! Excellent lateral thinking here. Looks fab. Excellent Mummy work. A+!! Poor mom was probably exhausted by all the work involved in making her daughter a princess room.